For those of you who haven't heard, Laura at Quokka Quilts is holding a little, er, big, design-your-own-FQ-bundle contest! 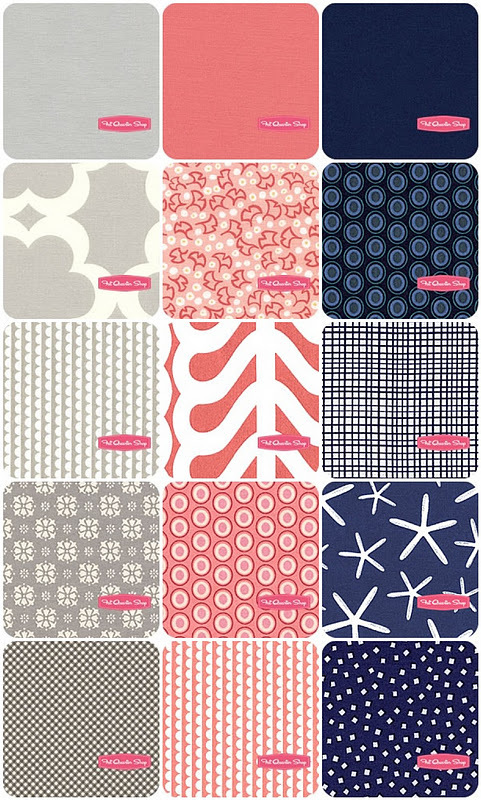 The winner will receive not a FQ bundle of their fabrics, but 1/2 yards! I'll pause why you all go check it out and create your own bundle........done yet? Anywho, this is mine! I was going for a modern nautical vibe. I keep wearing (and buying) all these striped shirts like I'm going to go sailing any minute. Um, yeah, I've only been sailing once. Now my problem is that I want to buy all these fabrics and make something! I made one from Ruby Star Rising tea cups and view master reels and one from Heather Ross Far Far Away II and III. These pouches were a life saver on my trip! I never had to find where I put my scissors or worry about little hands making off with my floss. Everything was always together and accessible. Amanda has graciously allowed me to give away a copy of her Hoop Travel Bag pattern! Just leave a comment to win! I'll pick a winner on Monday, January 9th. halfway done already! Seriously, we had no idea we were creating items so similar! It's spooky! I made this with AMH Innocent Crush and Essex linen in Natural. The HSTs measure 1.5" finished. The binding is some of AMH's premade bias binding, which I love! It's so nice to be able to grab something premade than shuffle through my stash and make some! I'm also playing catch up on some bee blocks. This one is for Sarah in the Twice Around the Block bee. She asked for any kind of star that finished at 12". I made a wonky star inside a traditional star. If you want to make this you will need: (4) 3.5" solid squares , (4) 3.5" print squares, (4) 3.5"x6.5" solid rectangles, and (9) 2.5" solid squares. I used the scraps from making the flying geese to make the wonky star in the middle so there is very little waste of your prints. First off, I love your FQ bundle! Good luck! I signed up for the dessert of the month club too, can't wait to start this week. I'm thinking I need a new embroidery bag for the sampler. Thanks for the inspiring shots of your hoop bags. i still need to make my bundle... i don't know if it will happen... love yours though. cute macaroons too kelly. Loves the color of your selection. Very pretty! I created my own fabrics bundle too..
Love your Bundle, and quite frankly everything else too!! I wouldn't pair those colors together, but they do work well. Great bundle! Love, love, love the hoop bags. The Heather Ross one is particularly adorable! Love your bundle and that cross stitch patterns are amazing! kelly your bundle is the bomb. seriously, its my winning choice! i thought this post would be about "the bad"...nothing bad here!! would love to win the pattern, i really really really need to learn zippers! this bag is a great size! I adore your pillow and your choices for the FQS bundle! very nice! I love the travel hoop pattern - what a great idea! thanks! The hoop bags are such a great idea! I especially like the 'viemaster' one! I need to cross stitch and embroider more often - it's a relaxing down time! Love your bundle and all your projects! I'm still battling with that ruddy bundle, but yours is looking great! Love the macarons, so cute! The whole 'using them' is putting me off making potholders and overn gloves because I know I'd kill my flatmate if he got them messy, and that would happen in about 5 seconds flat! Laughing about the cushions though, but hey, at least you knew you'd both love them! Love the wonky/traditional mix stars, fab idea! Ooh, I need a Hoop Travel Bag! Thanks for the Dessert of the Month reminder. I need to get signed up for that. And your bundle? Awesome!!! You and Amy crack me up. January 9th is my birthday and the Hoop Travel Bag would be a great gift! Eeep! I would love to win the pattern. I just did my first embroidery project since I was about 10 years old. It was so much fun, I can't wait to do more. Wow that pillow is fabulous, and you are too lucky with those potholders and oven mitt. I don't think I've seen the pattern for the hoop travel bag, yours look great, I'll have to look into that! Cute cute cute! I especially love the macaroons. Ive been doing a bit of cross-stitch and embroidery so would love the pattern. I just love your macaroons! All I can say about the Christmas/New Years swap aside from the items are just wonderful is that great minds think alike! Put my name in the hat for the giveaway please. I love your hoop bags! I need to make myself one bad!! Still using the good old ziplock! Ack! I love my pillow ;) made me a bag but I used your zipper pouch tutorial and made it bigger. Awesome! Love wonky inside traditional star block! And a hoop bag pattern is a great idea! 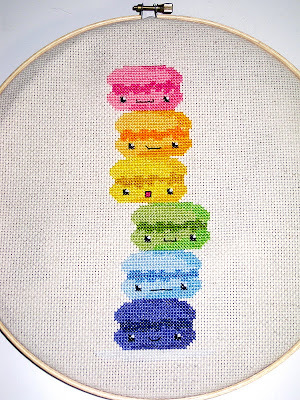 Is the cross stitch pattern you finished "macaroons" or "macarons"? Love it! Is there a chance you could share the macaroon pattern? It's no longer available.